The multi-barrier approach to drinking water quality helps provide greater protection. Sydney's drinking water is protected and tested at each stage of its journey from the catchments to consumers' taps. taps - in customers' homes and businesses. 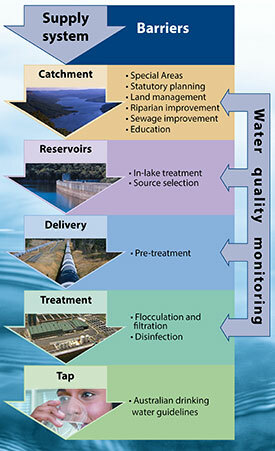 Protecting and testing water quality at each of these stages is called the multi-barrier approach. The multi-barrier approach recognises that although each barrier by itself may not completely remove or prevent pollution, all the barriers together provide greater protection that our water will be safe to drink. Sediment can run off the land and be carried into the water by rainfall, particularly after droughts and bushfires. It can increase the turbidity (cloudiness) of water. Pesticides and chemicals from farming and industry can pollute the water. Nutrients such as phosphorous and nitrogen from fertilisers and detergents can encourage algae to grow. Algae can change the taste and smell of water and clog up water treatment plants. Some algae, like blue-green algae or cyanobacteria, can produce toxins that make people sick. Pathogens are disease causing micro-organisms like Cryptosporidium and Giardia found in human faeces, animal poo and bird droppings. They can cause waterborne diseases. 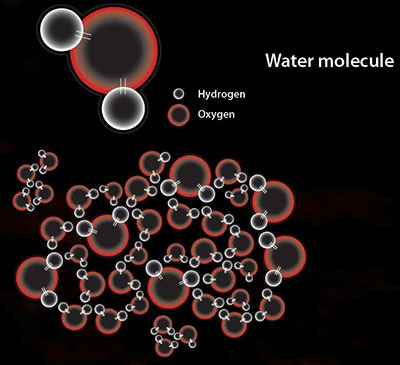 2 hydrogen atoms attached to 1 oxygen atom makes 1 water molecule. As water flows through the drinking water catchments, it collects pollution from natural and human sources. Water can be muddied by eroded soil or contaminated by organic waste from farms, dissolved chemicals from industry, or sewage and stormwater run-off from towns. Reducing these risks in the catchments is the first step in the multi-barrier approach to protecting the quality of water as it moves from the catchments to consumer's taps. Water is tested at each stage from the catchments to consumers' taps. After the catchments, the next steps in the multi-barrier approach to protecting water quality occur in the dams, canals and pipelines. 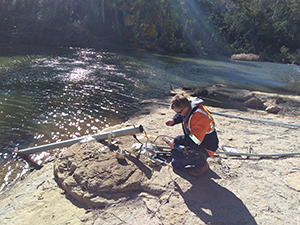 WaterNSW tests and monitors water at more than 100 sites in rivers, water bodies and groundwater throughout the catchments, in the dams themselves, and at the entry to water treatment plants. Samples are taken either by hand or with special equipment linked by satellite, at routine times and during wet weather. Monitoring results provides early warning of changes to water quality. Sydney Water continues the testing and monitoring of water quality at its treatment plants, in its distribution pipes, and at customers' taps. The concentration of a range of substances found in the water is measured to ensure levels are within the safety limits set by NSW Health and the Australian Drinking Water Guidelines.